This is the beginning of the unfinished manuscript, A Brief History of Newspapers in East Liverpool, Ohio, by the late Glenn H. Waight, former editor of The Evening Review. "I know of no state of slavery on earth like that attendant upon Newspaper life, whether it be as directors or subordinates. "Your task is never ended, your responsibility never secured, the last day's work is forgotten at the close of the day on which it appears, and the dragon of tomorrow waits open-mouthed to devour your thoughts and snap up one morsel of your vexed existence. "Be as successful as it is in the nature of things to be, difficult to praise and lion-hearted against blame -- still will the human frame wear out before its time." - American Union (Steubenville) "Exchange" Aug. 24,1853. TThe nature of "news" has changed greatly from the times when pioneers cleared home sites in the Northwest Territory's forests to today's "instant" television broadcasts. Early settlers in Columbiana County were more interested in possible Indian intruders or the price of salt in Pittsburgh than events in Washington or Europe. Styles of journalism have also undergone revisions to satisfy the interests of the people and the need to survive as businesses with margins of profit. Early printers in the colonies along the East Coast were the first newspaper publishers, issuing broadsheets as a sideline to their job work. Their pages contained facts important to the livelihood of residents of the community - ship arrivals and departures and public notices along with lesser items such as proclamations, gossip about the royal court, scraps of news brought over from England. This was hardly fresh, urgent information, not "the latest" since it was delivered by ships on voyages from Britain which took as long as two months and winter trips between Boston and New York lasting as much as two weeks. AS THE REVOLUTION approached in the 1770s, local papers printed more about the controversy with the Mother Country, their opinions favoring one side or the other. But little was conveyed about town happenings, and even during the war, only sporadic accounts of the campaigns appeared - often distorted and mostly inaccurate. 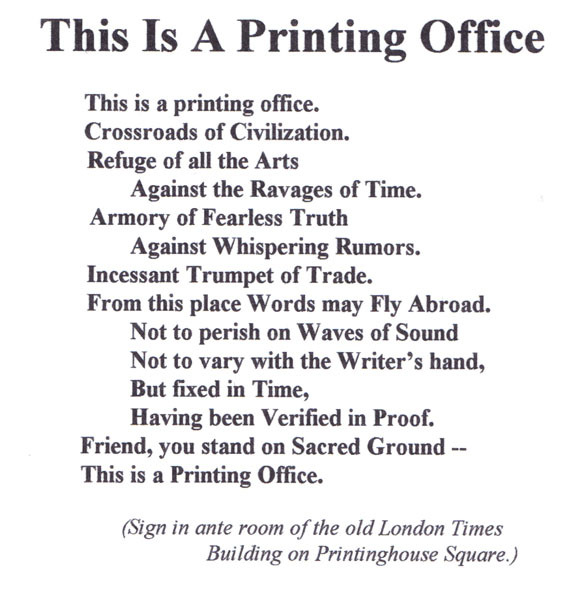 If these printers lacked expertise as trained editors, they labored without reporters. Local news was deemed unimportant - everyone knew what was happening in the small communities - and the printers could not afford writers. Among the first real journalists was Harry Ingraham Blake of the "New England Paladium" (founded in 1793) who has been called "The Father of American Reporting." Blake showed initiative, curiosity and energy, not waiting in his office for news to come in the front door, but searching out facts about ship movements by visiting coffee houses to talk with captains or getting into a pilot boat to meet incoming vessels regardless of the weather. Almost no press coverage followed the Constitutional Convention in Philadelphia. It was not until around 1800 that men working for Philadelphia papers started reporting the new federal government's activities. As the young nation grew, larger newspapers became the voices of political factions - Federalists or Jeffersonians or later, Whigs or Democrats, edited by men more talented as partisan debaters than printer-editors. Still the focus was not upon news, and reporters were rare. Editors dwelt on political issues, sought advertising and when necessary, acted as their own reporters. By 1800 Philadelphia had six daily newspapers, New York five and Boston three, most using "Advertise" in their names. They primarily targeted merchants, listing ship arrivals and goods loaded on the docks. But the press had clearly begun to move from the job printing sideline to a voice dedicated to one political party or another. By the 1830s, most newspapers were rabid advocates for the Democrats, Federalists or Democrat-Republicans. However at New York in 1833, a new trend was launched that would lead to a period late in the century when aggressive, individual editors dominated mainstream journalism. Benjamin Day started the "New York Sun,"a penny daily carrying news of crime, violence and domestic tragedy along with sentimental stories and humor -- much like the sensational press then popular in Great Britain. Within six months, the circulation of "The Sun" was 8,000, and by 1837 it had climbed to 30,000. Another New York penny daily was founded in 1836 by James Gordon Bennett who, with his "Herald," became a giant in newspaper publishing. Then came Horace Greeley and his "New York Tribune" in 1841 and Henry Raymond's "New York Times" a decade later. IN THE 1830s East Liverpool was a struggling little village on the muddy banks of the Ohio River, its great resources as a pottery center not to be tapped until 1840 by Eng-lishman James Bennett. Just two area weekly newspapers even reached the small community along with papers from Pittsburgh and Cleveland. Only after the establishment and growth of the pottery industry and arrival of workmen and their families did East Liverpool become large enough to attract investment in a newspaper. A mere 126 men, women and children were counted in the village in 1830. When Bennett arrived the population was 506. But by 1860, several potteries had been founded, a number of stores, taverns and other businesses flourished along Second St. and the railroad had been serving the town for four years. The census that year counted 2,000 in the village and Liverpool Township. One of two Pittsburgh men who had bought local real estate for development of the town saw the advantages of a local weekly by aiding the businessmen and further promoting expansion. Down in Wellsville was a printer/newspaperman who might be persuaded to launch East Liverpool's first press venture.